HASHTAGS: To use or not to use? There’s some evidence to show that user reach is inhibited by the use of hashtags and our own analytics shows the same. Of course this could change at anytime if Facebook adjust their algorithm. But that doesn’t mean you shouldn’t ‘ever’ use them. A hashtag is a way of grouping items in a conversation that’s searchable to bring all the posts together. So if you really need, or you think your audience needs to be able to find all the posts under one search term, then a hashtag could help you do that. Or….there may be a larger international search that you want your content included in. If the content in that group is all linked via a hashtag then you can ‘join’ in on that search by using the hashtag too. Essentially you’re popping yourself in to the eyes of their audience. As with all hashtags, stop and think. Using too many hashtags makes something visually horrid and can impact your reach. If you’re going to use hashtags, only use one for the point of grouping posts together but only if grouping is part of your strategy and you think people will actually need to search that way. Should you use a funny hashtag on a Facebook post? If you think it’s so funny that more people will react to it (thus give it more organic reach), then go for it. But it’s going to have to be bloody hilarious! If it isn’t the crux of the humour in your post, then lose it. Remember the hashtag is there to group things, if you create a hashtag from scratch and no one else is using it, then unless you’re starting a movement or have the Hashtag integrated in to a major sporting event, the chances are it won’t take off. If it isn’t already trending or relevant to anything that’s really happening, steer away. Oh one more thing, if you grab an Instagram post and automatically post it to your business page, the 30 or so hashtags you used on Instagram will visually pollute and likely pull back the effectiveness of it on Facebook. Just let it do the automatic share (if you have that setup) then edit it on Facebook to clean it up. Speaking of Instagram (and Twitter), on all social channels it’s good manners to only use hashtags that are relevant to your content. Hijacking something with content that isn’t relevant will mean you stick out like a sore thumb. Your content won’t belong there and that’s likely to make the audience disrespect you because they feel you’ve disrespected them. Oh, sorry another ‘one more thing’…if you’re going to use a hashtag, make sure you spell it correctly. Hopefully this clarifies some questions around hashtags. If you have a question about marketing pop them up on our Facebook page and I’ll answer them as I can. So should you change yours? Here are 5 things to consider before you even start the process. Everything about marketing is building trust and familiarity with audiences. Is there a specific reason you think you need a new logo? For example you might think your business needs a refresh. My question to you would be, “would it be better to invest in things that better the customer experience?”. Unless the experience is dead set perfect, and I bet it isn’t, then the logo isn’t where your attention should be going. 2. Does the existing logo have context? “Is this logo any good?” I’m often asked that question with the expectation of a ‘yes’ or ‘no’ answer. That’s impossible for me to answer properly, that question can’t be answered without knowing the context. To answer that with any level of expertise, we must first know how it needs to perform, who it needs to attract, the thoughts it needs to conjure and the values it needs to represent. The only time I’d recommend a business do a ‘complete rebrand’ is when it was in trouble. If the last owners had built a bad reputation (in which case I hope you didn’t pay for any goodwill), or if your product has become irrelevant and you’re keeping the bones of the business but essentially building a new one. Don’t ask your friends what they think, ask potential and best current customers what they think. Friends don’t know the context and probably aren’t even users of your business. Remember a good logo must attract the people who will be your best customers. Depending on how drastic the logo ‘evolution’ don’t have two logos out there in the market place at the same time. It’s just confusing – it creates clutter, the complete opposite of smart marketing. If you can’t afford to make a logo change and take it across your buildings, cars, business cards, stationery, website etc. then save a bit longer. Brand evangelism is something critical to business. It’s the act of having customers and promoters so in love and so trusting of what you do that they’re excited to tell the world about it. It is of course the most effective and trusted form of marketing. The word evangelism is tightly linked to the Christian faith, and whilst I’m not a particularly religious person, I know that business can learn a lot from the way in which religion operates. The free will part here is important. People aren’t being enticed by money or incentives, they’re down it because the whole heartedly believe in you and in your business’s values and ethics. The most famous, if not first user of the term evangelism for marketing was Guy Kawasaki, “chief evangelist” at Apple. Justin Bieber labels his fans as ‘beliebers’ – and if you haven’t yet noticed, in the eyes of these ‘beliebers’ Justin can do no wrong. 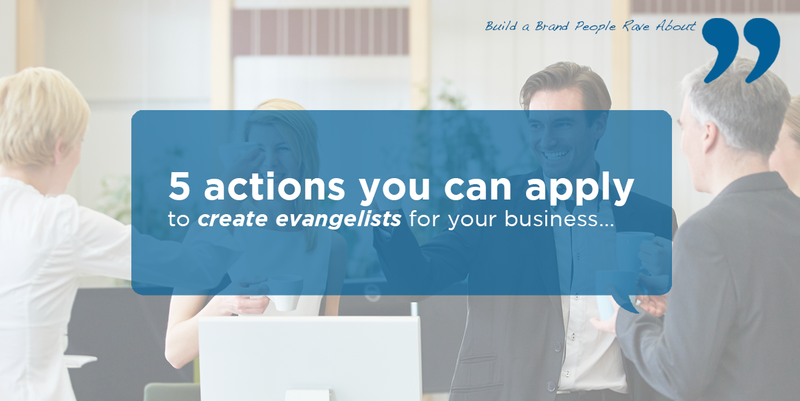 So what are the 5 actions you can apply to create evangelists for your business? People connect with what you stand for if you have a story that’s relevant to them. Be clear with your narrative. The best way to do this is to have an easily accessible set of ‘key messages’ that stands the test of time. They’ll likely be messages that you’ll get bored of well before your ‘believers’ do. Then show examples/proof of how those key messages relate directly to the lives of your target customers and how your business delivers on these key messages. What do they need? When are you most important to them? If you don’t know the answers to these basic questions, then your brand is unlikely to find a space in their mind and will have no chance of finding a space in their heart which is where evangelism lives. The only time most religions come under attack is when they’re seen to have double standards (although the evangelism amongst believers is usually high enough to negate the occasional slip up). Only through consistency will people feel comfortable enough to sing your praises, because they have to be sure that what they experienced is what their friend is likely to experience. If anyone has ever been to a church service, especially the more modern churches, you’ll see that many resemble a rock concert. The music has highs for inspiration and aspiration, and lows that conjure the chance to reflect on where you’re at in life. Every part of the service from the video screens, to the lighting, to the tone of the ministers voice is perfectly timed, to deliver the narrative properly and to reach out to the emotions of the audience. Many pyramid selling schemes, and even corporate speakers also utilise the same techniques to ensure people are engaged with the purpose of being there. It’s not trickery, it’s just plain smart. How is your business engaging with the emotional journey of your audience? The thing about religion, despite the fact that religions tend to have both positive and negative outcomes, is that people are driven to take whatever action they’re taking because they intently believe they’re making the world a better place. Let’s be clear what some people see as loving, others see as evil, but the common thread is that both sides are doing it because they believe it makes the world better. So, how is your product or service improving the world? Know it, show examples of it and keep it clear in your messaging. Business can learn a lot from religion. And it shouldn’t be assumed that people of faith already know the tips above. In fact because they’re within the cycle, they may even be less likely to see it, or if they’re aware they may just never have thought of transferring the key principles to business. Word of mouth marketing is always the most effective marketing. It’s less about what you advertise, and much more about your values and key messages experienced through touch points that will bring customers inbound.